An over-the-top arcade mode for for the Wii version of FIFA 11 allows players to score wall goals, blast shots, and shoot shockwaves through opponents. 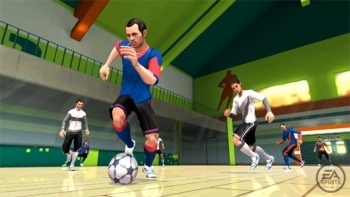 Players picking up the Wii version of the upcoming FIFA 11 will find two different ways to play soccer. In addition to the traditional eleven on eleven stadium-based matches, the Wii version will feature an exclusive "street" soccer mode. These street matches drop the strict rules of the FIFA federation in favor of an over-the-top arcade game, complete with power-ups and wall-goals. FIFA 11's street mode pits five-player teams against each other in the alleyways and warehouses of Brazil, England, France, and a number of other countries. Each character will be outfitted with their own distinctive style and abilities, and the indoor locations will allow you to use the wall to jump over rival players or to bank passes to teammates. The street matches are highly customizable. Players will be able to choose different victory conditions - first to score, timed, or tug of war - and toggle a number of different modifiers to the playing field. Some of the modifiers revealed include elevated nets, wall goals, shrunken nets, and most interestingly, an arcade mode. The arcade mode adds a power meter for each player. Once it is filled, you will be able to "blast shots, ignite a speed burst or send shockwaves over your opponents." In many ways, this mode seems to bring the FIFA series in line with Electronic Arts' upcoming remake of the arcade basketball game NBA Jam. FIFA 11 will hit the Nintendo Wii, Xbox 360, PS3 and PC on October 4.